A bomb dropped by an Israeli warplane destroyed the Palestinian Foreign Ministry building in Gaza City early Thursday, causing widespread damage in a nearby neighborhood and wounding 13 people. The Israeli military confirmed it carried out an airstrike on the Palestinian Foreign Ministry, saying it is "led by Hamas" and has been used for the "planning of terror attacks." The Palestinian foreign minister is Hamas leader Mahmoud Zahar. The Israeli military told The Associated Press that it believes Zahar's office has planned and directed militant attacks such as rocket strikes on south Israel and the capture of Shalit. Earlier, Israel invaded Lebanon after Hezbollah fighters captured two Israeli soldiers Wednesday and killed three others. "Israel is fighting violence now on two fronts. Both Hamas and Hezbollah have provoked the conflict, focusing international attention on Iran and Syria for their support of the cross-border attacks by both groups," says CBS News foreign affairs analyst Pamela Falk. "World powers are concerned about the potential for escalation of the conflict in the region." The Gaza strike took place after 1:30 a.m., sending a fireball and huge plume of smoke up over Gaza City. Thirteen Palestinians, including six children, were wounded in neighboring buildings, mostly from flying glass, medics at the scene said. It was not known if anyone was in the ministry at the time. Ambulances and rescue services raced to the scene. 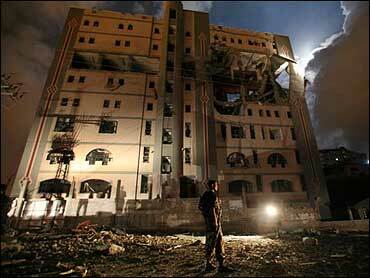 Houses and cars in the area were badly damaged by the force of the blast, which blew huge holes in the sixth, seventh and eighth floors of the nine-story Foreign Ministry building. The ministry is located in a complex of several government buildings that include the finance ministry. The residential area is located across a narrow street. Israel has been waging a two-week offensive in Gaza after Hamas-linked militants carried out a cross-border raid on June 25, killing two Israeli soldiers and capturing a third, Cpl. Gilad Shalit. On Wednesday, an Israeli aircraft dropped a quarter-ton bomb on a house in Gaza City where Hamas commanders were meeting. The killed a Palestinian family of nine — including seven children, reports CBS News chief foreign correspondent Lara Logan. "As bodies were pulled from the rubble here, you could feel the crowd, the anger of the crowd," Logan said in an exclusive report from the scene. The attack badly wounded a Hamas militant leader, Mohammed Deif, who has topped Israel's most-wanted list for a decade. Deif could end up paralyzed, Palestinian security officials said on condition of anonymity. Wednesday's blast marked the army's fourth attempt to kill Deif. In a 2002 missile strike, he lost an eye. In Lebanon, Hezbollah guerrillas dug in for a heavier assault as their supporters celebrated the dramatic raid. But some were showing reluctance over being dragged into a fight between Hezbollah and Israel — a sign the Shiite Muslim guerrilla group could risk alienating some Lebanese with an operation aimed at winning the long-sought release of prisoners. This is the first time Israeli troops have conducted a major combat operation on Lebanese soil since Israel withdrew from the areas six years ago, reports Logan. Some Israelis say the Hezbollah attack could provide Israel with a legitimate reason to take action against Hezbollah. Hezbollah fighters armed with rocket-propelled grenade launchers fanned out at the border village of Rmeish, across the frontier from where the soldiers were captured and where a few dozen Israel troops crossed into Lebanon as part of Israel's retaliation. With some Lebanese hunkering down in their homes in expectation of even heavier bombardment, the leader of the guerrilla group vowed that Israeli military action would never win the release of the two soldiers, calling the idea "an illusion." "We have no intention to escalate or to start a war. But if the enemy seeks that they will pay a price. We are ready for a confrontation to the extreme," a confident and relaxed-looking Sheik Hassan Nasrallah told reporters in south Beirut, a Hezbollah stronghold. It is not clear whether Hezbollah, a Shiite group, coordinated its attacks with Hamas, which is Sunni, says CBS News 60 Minutes correspondent Bob Simon, but Hezbollah's action give Hamas just what it needs: a second front for Israel. Both groups are similar, Simon reports, in their aim of wiping Israel off the map. "It would take a considerable degree of outside diplomatic involvement and pressure to get the Hezbollah in Lebanon and Hamas in Gaza to cough up the Israeli prisoners whom they've seized, in both cases, inside Israel," explained Robert Lieber, professor at Georgetown University's School of Government and International Affairs. "In terms of the UN charter, Israel has acted in self defense." U.N. Secretary-General Kofi Annan on Wednesday called for an end to escalating violence in the Middle East and demanded the immediate release of the two Israeli soldiers. Syrian Vice President Farouk al-Sharaa denied his country had a role in either of the abductions and blamed Israel for the attacks. "For sure, the occupation (of the Palestinian territories) is the cause provoking both Lebanese and Palestinian people," he said. Nasrallah sought to rally Lebanese behind Hezbollah, calling on the government — which is dominated by opponents of Syria, Hezbollah's top ally — to form a "national front" against any Israeli assault. But the government kept the group at arm's length, hoping to save the military and the infrastructure from massive Israeli reprisal. "The government did not know, does not bear responsibility nor embrace what happened," Information Minister Ghazi Aridi told reporters after a Cabinet session Wednesday evening. "Regardless of the good intentions, all of Lebanon and its people are subjected to this," Samir Geagea, an anti-Syrian Christian leader, told Lebanese television, criticizing the Hezbollah action. U.S. Secretary of State Condoleezza Rice said the attack undermined regional stability, adding that she spoke to Israeli and Lebanese officials as well as U.N. Secretary General Kofi Annan to discuss the incident. Israeli troops shot a Hezbollah guerrilla later Wednesday as he tried to cross the border, the Israeli army said. Israel denounced Hezbollah's raid as an "act of war" and said it held the Beirut government responsible. Three Israeli soldiers were killed in the raid and four others were injured when an Israeli tank crossing into Lebanon afterward hit a Hezbollah land mine. Army Chief of Staff Lt. Gen. Dan Halutz warned the Lebanese government that the military will target infrastructure and "turn back the clock in Lebanon by 20 years" unless the soldiers were freed. In the past, Israel has hit power stations feeding electricity the Lebanese capital, where one third of the country's 3.5 million residents live. Throughout the day, Israeli warplanes and gunboats in the Mediterranean battered southern Lebanon, hitting roads, bridges and Hezbollah positions in areas as deep as halfway between the Lebanese-Israeli border and the capital Beirut. Anti-aircraft guns opened fire on jets flying over the coastal city of Sidon, capital of southern Lebanon. In the evening, warplanes made their closest strike to Beirut, destroying a seldom-used coastal bridge near a hilltop Palestinian guerrilla base 10 miles to the south. Jets also struck a minor bridge, north of the provincial capital of Sidon, witnesses said. The main bridge and highway remained intact, however, in what appeared to be a gradual Israeli escalation aimed at slowly applying pressure on Lebanon to release the soldiers. In Beirut, businesses went about as usual and traffic was normal during the day. Motorcades honked in jubilation over the capture of the Israelis, and residents of south Beirut, a Hezbollah stronghold, fired guns in the air, set off firecrackers and distributed sweets in celebration — as did Palestinians in the Ein el-Hilwa refugee camp and southern Lebanese villages. But the jubilation gave way to concern in the evening. Some people rushed to supermarkets to stock up on food. Others were glued to the TV to follow the news as rumors spread of possible heavier Israeli attacks on infrastructure. But there was no sign of Lebanese fleeing the south, and some remained defiant. "We will rebuild whatever Israel destroys," Kamel Leila, a 54-year-old resident of the southern village of Ghaziye, said. Several bridges along the main north-south road along the coast were targeted, some hit several times to ensure they were destroyed to cut off movement between the south and the rest of the country. Two civilians were killed in one strike, Lebanese officials said. Seven missiles barraged a single, key road junction at Zahrani and one driver was killed, and two people were wounded.